Connect electronic drum pedals and expression pedals to your computer. 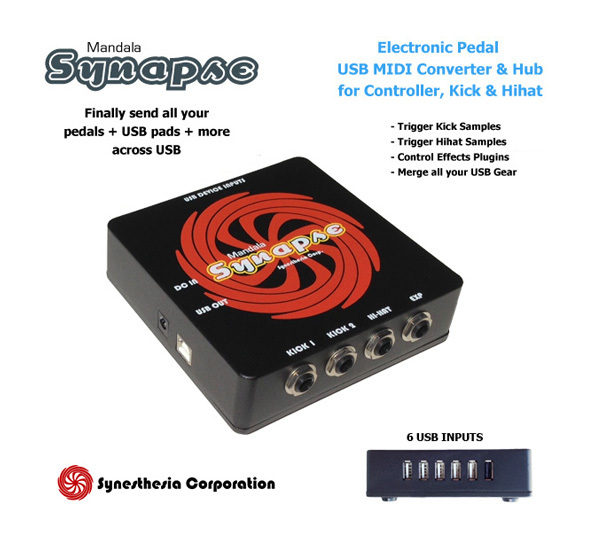 Synapse accepts two electronic kick pedals, one electronic hi-hat pedal and one or two expression pedals and turns their output into USB MIDI so your playing can be sent straight into your computer to control any program you want. There are also six USB inputs to merge all your USB equipment into the stream. Actually, you can use those inputs just as you would any standard USB hub. The Synapse internal USB merging is done by way of a high quality hub that we've integrated into Synapse circuitry. Each 1/4" pedal input is tunable both digitally and mechanically to the sensitivity you desire, and the MIDI output (note number/velocity curve or controller number) of each pedal is definable by the user with a simple included computer utility application (PC & Mac). Home Studio Composers - Electronic musical equipment is offering musicians lower costs, more effects, bigger sounds, and the ability to record it all in a home studio. Now use your feet to trigger sounds and alter effects while your hands are busy playing. Drummers - Danny Carey says "Any good drummer plays music. He doesn't just play beats, and he participates in the musical experience." Danny plays seven Mandala Drums and two e-pedals mixed in with his acoustic drum kit on tour and in the studio. Synapse is devised from the circuitry that helps him incorporate all his equipment into his vast setup which includes the very best acoustic and electronic gear. Guitar Players - If you ever play your guitar through your computer or just straight into your computer (plugins, MainStage, Guitar Rig, etc.) you know how important it would be to have a controller pedal to affect your sound as you play. 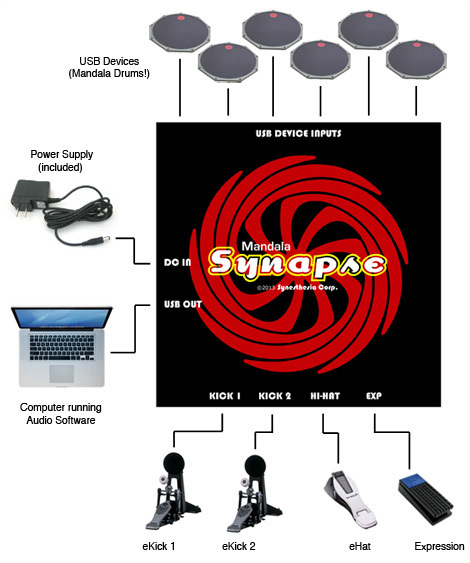 Synapse lets you connect two standard expression pedals to your computer and use them to control realtime effects by way of MIDI controller input to your programs. DJ's - For most it's got nothing to do with two turntables and a microphone. You want the newest tools of the trade integrated into your performance. 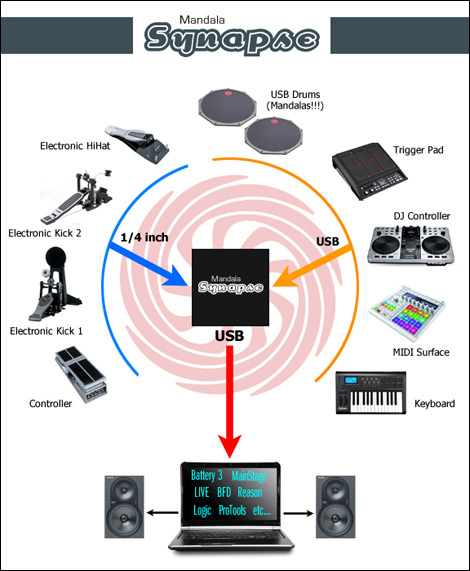 Synapse allows you to play USB instruments and use foot pedals to trigger and affect sounds so that you can perform at your highest level. Singers - Are you sending your vocals through any computer programs to liven up your sound? Now connect an expression pedal and alter your signal as you sing. Assign the pedal to different parameters of your effects program to do things like increase reverb, bend pitch, add saturation, etc. 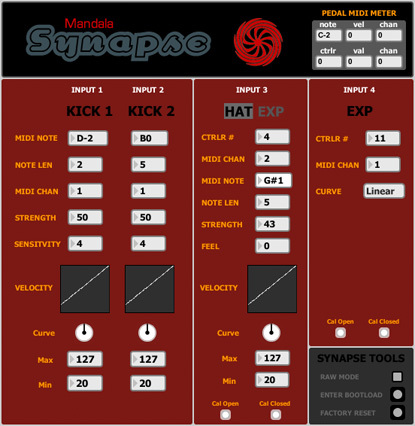 Downloadable Synapse Settings software (PC & Mac) allows users to customize Synapse MIDI output of each pedal (eg. note number/velocity curve or controller number). All settings save to internal Synapse memory.